Kale is a major vegetable grown in my home garden along with tomatoes and garlic. Last year 16 plants (4 varieties) were left to winter-over with great success. Here are my main reasons for leaving them in our home garden in the Fall. 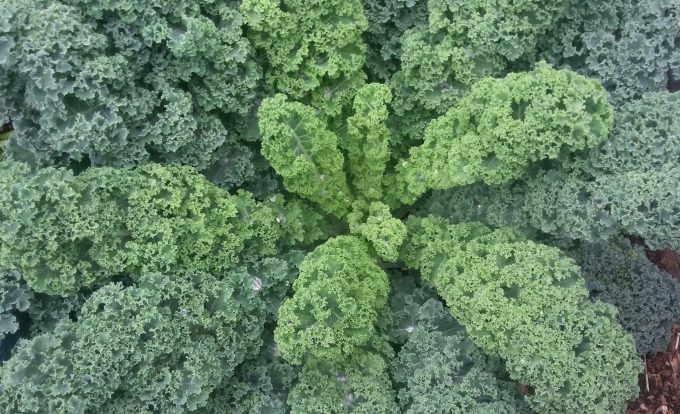 Kale is usually the last summer / fall vegetable in the garden besides parsley and other herbs. We leave it to over winter with no special attention except for mulch (leaves are great). 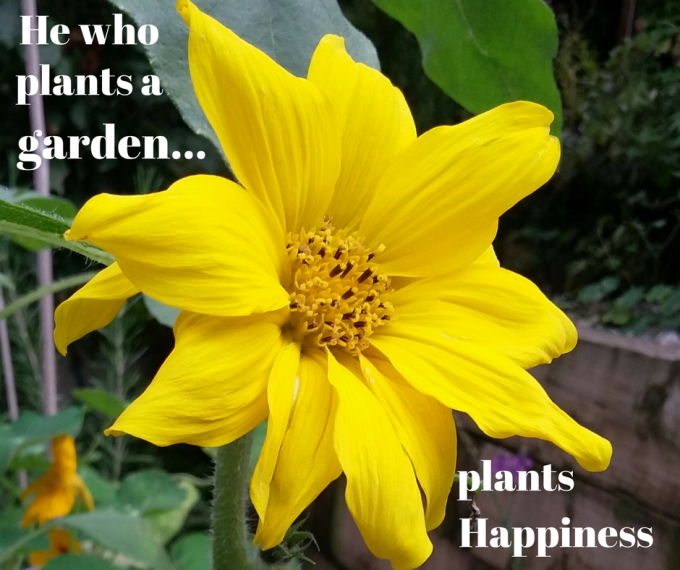 In the following Spring the tall plants are re-staked and dead branches or leaves discarded and the first compost is spread in the garden. It’s great to be able to grow your own greens almost all year. 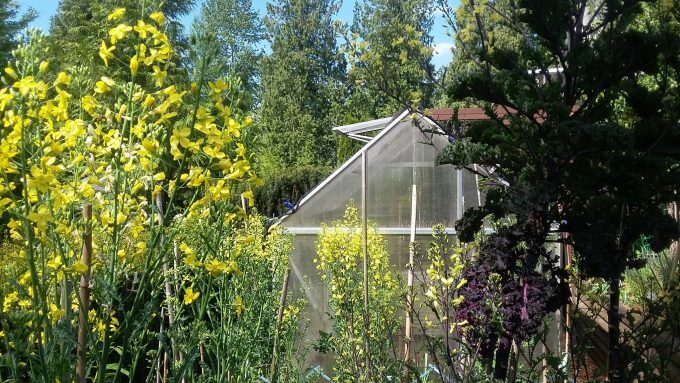 This year the kale flowers were in full bloom the same time as the apple trees, blueberry bushes, the solitary gooseberry bush and many strawberry plants. In the last few years there has been an obvious shortage of bees and insects to pollinate especially last year due to a very wet, cold spring. 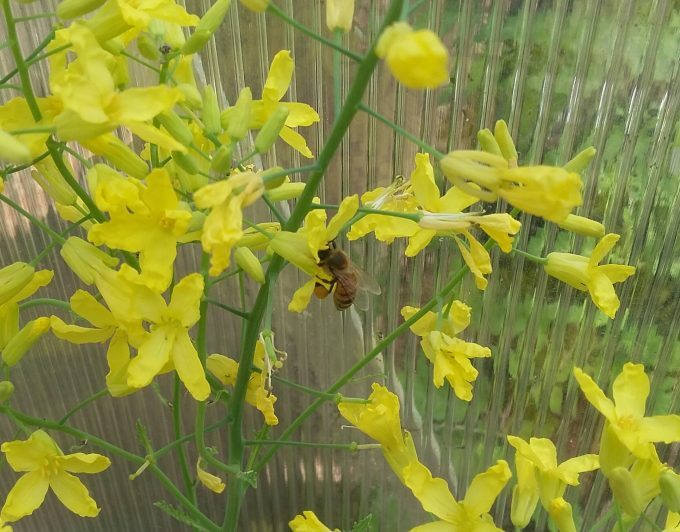 The bright yellow flowers attract many bees and other insects to help pollinate the large number of blossoms in the gardens. A bonus. Kale is the first green along with rhubarb, chives, sorrel and parsley to pick in the early spring. Masses of small branches emerge from where the previous leaves were picked with plenty for salads, quiches, frittatas, soups and vegetable juice. It is such a treat to pick juicy new shoots and flowers. Once the flowers have finished four plants are left to go to seed. Seeds are left for the birds to eat and some always seem to manage to re-seed and are replanted to start all over again. Even though the garden is small, there has been room to plant packets of radish, spinach, parsley and early snap peas (both bush and pole varieties) before pulling out the remaining kale and transplanting some tomatoes from the greenhouse. There are always discarded leaves (especially after winter due to snow damage, frosts, etc). The main disease problem I have had with the kale is the white cabbage moth which lays eggs on the leaves. These I have been able to wash off but if any plants look diseased they should be discarded elsewhere and not into the compost. This is a super lazy way to garden and if you have the space in your outdoor garden why not? The garden here is dormant most of the winter so works well for fresh greens, sweet and chemical free early in the spring.